Learn to Gig | FLOUNDER GIGGING! ROCKPORT, PORT ARANSAS, CORPUS CHRISTI, TX! 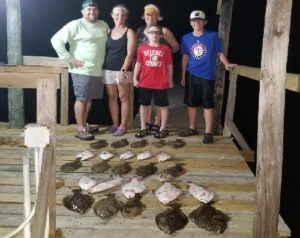 Captain James wants you to know exactly what to expect when you come on your flounder gigging trip! 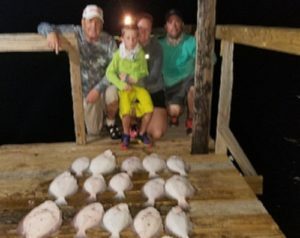 Yes, he is truly a remarkable and knowledgeable professional flounder gigging whose sole mission is to ensure that everyone has the time of their life while gigging flounder! Safety is always “Priority One” and this captain has taken every safety precaution for his customers. Relax and know that you’re in the most capable hands possible! In order to gig a flounder, one must be able to spot the flounder. 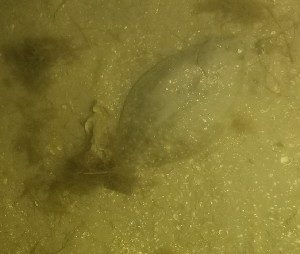 Can you spot the flounder in the photos below? 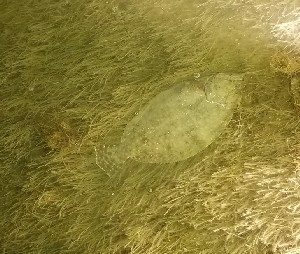 If you had a little bit of trouble spotting the flounder hiding under the sand, don’t worry! Capt. James has special underwater lights on the boat that light up the water! Once he shows you what to look for, you’ll start spotting them! It’s really a lot of fun!! As with all things, practice makes perfect and your professional guide will be there for you every step of the way! Gradually lower your gig into the water until the gig is a few inches above the flounder. Then, give it a quick, swift jab. Raise it up out of the water and into the boat. Sometimes, folks get so excited that they loose the fish, so patience and accuracy are a must. Once you get the hand of it though, you’ll know exactly what to do and Capt. James will be there to help you gig flounder successfully! a. How long are the trips? Every trip is different because tides, currents, moon phases, wind are just some of the factors that may affect where the flounder are hiding. Some people miss the fish while others miss a only a few. Sometime we don’t see a fish for the first hour or two, but a normal trip is 5 to 6 hours long, generally speaking. For this Captain, it is more important that you have ample time to catch your fish versus doing everything by the hands on the clock. Youj’ll gig until you limit out on flounder or until the sun comes up. You can always request to go back-in to the dock at any time, so just let Capt. James know you’re ready to go! b. Do I need a “State License” to gig flounder? Yes! Everyone who will be fishing or gigging must have (in their possession) a State of Texas License with a special Saltwater Stamp. Click the Texas Parks and Wildlife logo to get all the details on how you can get your license online. You can also obtain your license at local tackle shops, some area convenience stores, HEB Grocery, Walmart and the large chain stores (like Academy and Bass Pro Shops). c. What do I need to bring? Capt. James provides everything you need! Evenings on the water can sometime carry a little chill in the air, so good to have a light jacket or appropriate clothing as the weather dictates. Closed-toe, non-skid shoes (like tennis shoes) are recommended as the deck of the boat can be wet at times. Mosquito spray might also come in handy during the warmer months and a cell phone with a camera is awesome to bring along so you can capture that perfect moment, digitally and send it to all your friends and family! Last but not least, you can bring your favorite beverages and snacks – beer and alcohol are ok, but please drink responsibly. d. Where do we board? When you call Capt. James to make your deposit and reservation, he will give you instructions as to where to meet. He will also call to confirm with you (approx. 36 to 24 hours in advance of your trip) to ensure that you have the location and time to meet him at the dock. You could launch for a couple of places and he’ll fill-you-in on all the details!! e. What about young children gigging at night? Families with Children – Always Welcome! Really young children (let’s say 4 to 6 years old) will get tired and need to go back in early. The excitement and fun of being on a boat at night can wear-them-out. Capt. James leaves that up to you – the parent – as to how long is long enough. 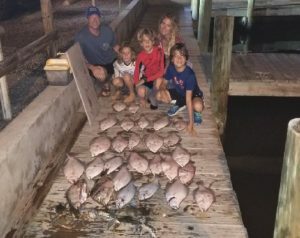 Coast Guard approved children’s live vests (PDF) for safety are offered, however if you have a PDF that fits your child snuggly, yet comfortably, that makes the kiddos happy and they have a much better time watching the flounder being gigged and brought into the boat! Older children of course, do fine on these trips (ages 8 to 12+). These are just some of the questions that customers often ask. If you have a question or have a special need, just ask the Captain when you speak with him or you can send him and E-MAIL right now!